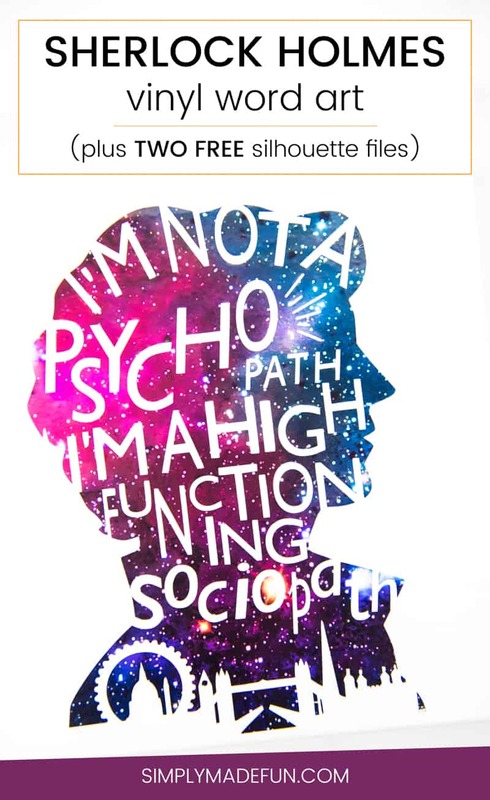 Declare your love for everyone’s favorite sociopath with this Sherlock Holmes Word Art! I came across Sherlock Holmes pretty late to the game. Last year Chris and I binge watched it on Netflix on the nights our newborn hated sleep, and both of us were hooked after the first episode. Did you know that Sherlock is even more hilarious when you’re sleep deprived and a bit loopy? 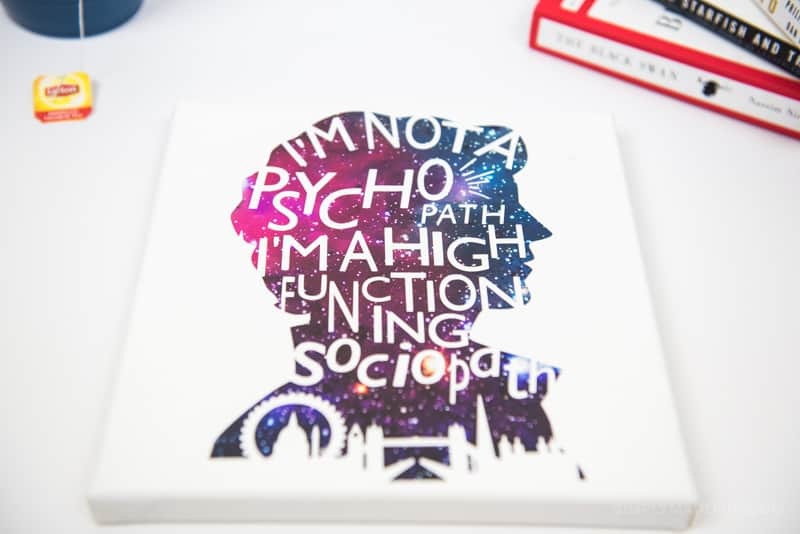 After three seasons we are completely obsessed and showing our love for our favorite shows in a really fun (but strange to our family) way; with Sherlock Homes Word Art! With all the adaptions of Sherlock Holmes I have to say that Benedict Cumberbatch is definitely my favorite. I mean, I love Robert Downey Jr (who doesn’t really?) and both men do the role justice but Benedict just plays the role of a high-functioning sociopath so well. And he’s incredibly fun to watch, though season three about killed me. A long time ago I decided that when we finally buy a house it will have a media room. We watch a lot of tv y’all, it’s only right to dedicate an entire room to it. And because I like to plan way far ahead I’m already working on the decor for the room. 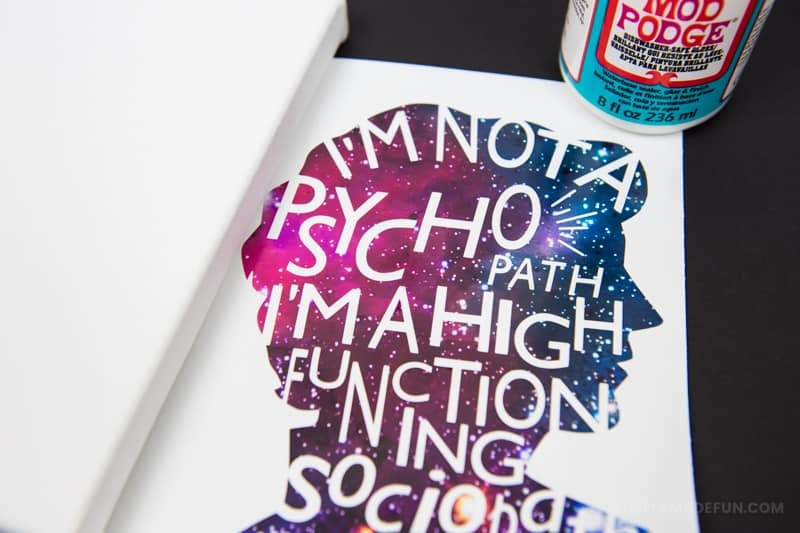 Starting with this fun Sherlock Holmes Word Art! Grab the Free Files to Make Your Own Sherlock Holmes Word Art! Download the FREE Sherlock files! PRO TIP: Paint a layer of mod podge over your canvas. Vinyl doesn’t stick well on a canvas so painting a layer of mod podge helps with that. You could also use heat transfer vinyl too (like I did here). Set it aside and let it dry. + Place a large piece of transfer tape on top of your file and use a tool to rub it onto your design. Slowly peel the transfer tape up, making sure that it takes the Sherlock design with it. If you notice that pieces aren’t pulling up just put the transfer tape back down and rub it onto your design. Repeat the process until all the pieces are picked up and stuck to the transfer paper. + Place your piece of transfer paper that has the design on it down onto your canvas (making sure that the layer of mod podge is dry first!). Using one of your Silhouette tools rub the design onto your canvas. Start to pull up the transfer paper, going slow and making sure that all the pieces of your design are sticking to the canvas. If they aren’t, layer the transfer paper back down and continue to use your tools to rub the design onto the canvas. Repeat this process until all the pieces of your design are on the canvas. This was my first time designing a file like this and I am so in love with it! I’ve always shied away from designing my own because I felt like they were complicated and that they wouldn’t turn out well. Well, my first attempt wasn’t great but once I got the hang of it I found that designing was pretty therapeutic. Plus, they got better and better the more that I tried. So watch out for more files like these in the future! I cannot wait to hang up this Sherlock Holmes Word Art in our (way far into the future) media room. I really love the colors of the vinyl and I’m excited to design even more nerdy crafts to hang next to it. Download the FREE Sherlock files before you leave! What are you most looking forward to in the new season of Sherlock? Please note that any and all files shared on Simply Made Fun are for PERSONAL USE ONLY. You may not resell, redistribute, or alter the designs in any way. Thank you! You can also check these popular nerdy craft projects!